The FS-8-MB-E Stack-On electronic guns safe allows easy and fast access with its key pad lock. Stack-On makes sure their electronic gun safe is just as drill resistant as a product with a combination lock would be because it includes a drill resistant, hardened steel plate behind the lock. The electronic gun safe lock operates with 4 AA batteries which can be changed from the front of the safe. This feature plus the over-ride key assure you will never be locked out. Add the ETL fire rating and you can't find a better small electronic gun safe! 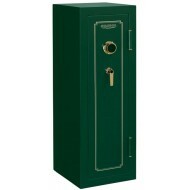 This Stack-On gun safe includes an electronic key pad lock with a drill resistant, hardened steel plate behind the lock which provides greater security. Tested at 1400F for 30 minutes, the Stack-On gun safe will keep contents safe for that length of time. The exterior is an attractive durable black paint with chrome accents. 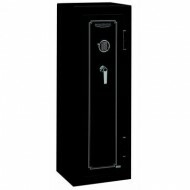 This Stack-On gun safe includes a 3-number combination lock with a drill resistant, hardened steel plate behind the lock which provides greater security. Tested at 1400F for 30 minutes, the Stack-On gun safe will keep contents safe for that length of time. The exterior is an attractive durable hunter green matte paint with gold accents. This is American Security's smallest gun safe with a capacity for 8 long guns. Still it includes some of American Security's finest features. The body is constructed of 14-gauge solid steel and the door has a 3/16" steel plate door. 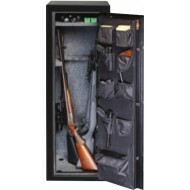 The entire gun safe is insulated for a Mercury I 30 minute fire protection rating. With this gun safe you have a choice between a combination lock (3 wheel with spy-proof dial) or electronic lock (illuminated). Both locks are protected from a drill attack by a steel hard plate. 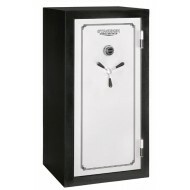 The 55 1/4" tall safe includes 3 way boltwork with five active 1" chrome plated bolts and 3 deadbolts. 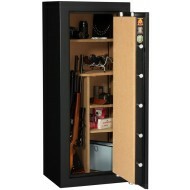 While small, it is an attractively finished gun safe with a mocha fabric interior and a durable black textured exterior. If you need indoor delivery for this 493 lb safe, please call 1-877-442-9964. There is an extra charge. This electronic gun safe from Stack-On has high security features such as a reinforced door, 5 live locking bolts and 3 dead bolts. An ETL waterproof and ETL fire rating are attached to this electronic gun safe. The interior is fully carpeted; has adjustable shlves and has gun barrel rests and stand offs for scoped guns. You can store up to 28 long guns in this Stack-On model. 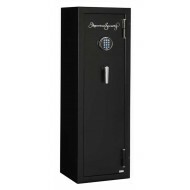 The electronic gun safe features a battery operated key pad that offers quick access. It is pre-drilled for bolt down to the floor. With this Stack-On gun safe get the triple protection of high security features, ETL waterproof rating and ETL fire rating. 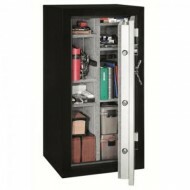 In addition, this gun safe has a drill resistant combination lock with a solid steel plate behind the lock. This Stack-On gun safe can hold up to 28 long guns. The interior can be configured to meet your needs. If you only need to store 14 or less rifles, you can have side shelves for handguns or other valuables. Or if you simply want to use it for storage of small items you can have up to 6 shelves and a total of twelve cubby holes.